Player-coach Matt Goode says it’s still about the performance not the result ahead of this weekend’s crucial clash with Old Centralians. 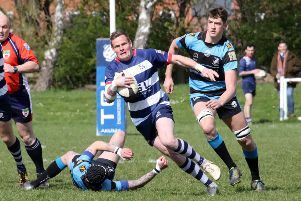 Following their defeat at leaders Newbury Blues, Saturday’s fixture with Old Centralians at the DCS Stadium now looks like one Bulls have to win to get back into contention for the play-off spot in Wadworth 6X South West One East. Bulls haven’t won since the Chippenham game when Goode was disappointed with the performance. Would he swap results for performances? He said: “Obviously results are important but for me personally its about performances. I was really disappointed at Chippenham but I’ve been really impressed with the way we’ve conducted ourselves in the past few weeks.